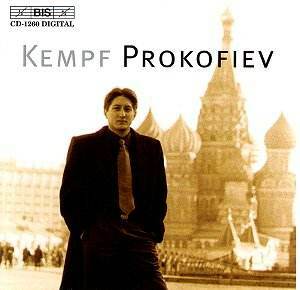 Freddy Kempf, the 26-year-old British pianist with a Japanese mother, German father, Russian wife, and Swedish recording contract is a remarkably talented mongrel. He has recorded five out of ten solo recitals for BIS (Schumann, Rachmaninov, Beethoven, Chopin, and Liszt) and his latest release features works by Prokofiev, including three short pieces by the young composer, and two of the three so-called �war sonatas� written about thirty years later. Prokofiev�s first sonata is seldom heard in concert. It is essentially a string of rhetoric packaged in dense textures similar to those found in the piano sonatas of Scriabin, Medtner, and Rachmaninov � imagine a Chopin ballade on vodka. It is a work which Frederic Chiu, the American pianist, describes as being �agreeably musical � but lacking the piquant imagery that peppers his other works.� Kempf dashes through the piece with a youthful abandon appropriate for this teenage composition, making the most of what the composer in his later years unkindly referred to as �a piece of juvenilia�. Compared to this engaging performance (which, for me, turns out to be the highlight of this CD) Glemser�s account on Naxos appears well-mannered and relatively pedestrian. The fearsome technical difficulties of the following Etude (Op.2 No.1) and Toccata are swatted aside with apparent relish, providing an impressive and enjoyable opening to this recital. The sixth and seventh sonatas are two of Prokofiev�s most frequently performed and recorded piano works. These are accomplished performances but ones which do not adequately reflect the words of Richter, the dedicatee of the 7th sonata, who spoke of how these sonatas take one �into a world which had lost its balance�The powers of death and destruction rage before the eyes of people who nevertheless find that which makes life worth living continues to survive�. Both Richter�s and Kissin�s performances of the sixth, and Pollini�s seventh, transport us some way towards this description. For all Kempf�s commanding dexterity in the outer movements, the slow movements in both sonatas show him at his best, where his thoughtful phrasing and mellow tone allow a bleak atmosphere to develop. In other places, such as the motoric precipitato of the seventh sonata, where some of the accents and phrasing sound as if they have been influenced by other musical genres, there lacks a convincing, or at least a mature, interpretation. Perhaps this is due to slightly over-indulgent rubatos which trip up the musical momentum, and one might also blame the sound on this recording for being too warm to ideally capture the percussive elements in Prokofiev�s music. Although this CD will please Kempf�s fans and does no harm to his reputation as one of the most promising young British pianists, I wonder if there is any justification other than marketing considerations which lead him to record pieces which already saturate the catalogue. Why were the other three Op.2 etudes not included? Apparently, he has recently recorded the complete Chopin etudes; those looking for a taster may be interested to know he will be playing the Op.25 at the Wigmore Hall in mid-December.